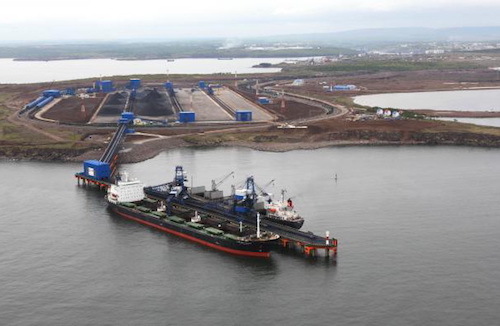 Nomura Research Institute, Ltd. (NRI), in cooperation with Idemitsu Kosan Co., Ltd., analysed the environmental protection measures and means used at the port coal terminals of SUEK. In the summer of 2018, experts from NRI and Idemitsu visited two terminals of SUEK: Vanino Bulk Terminal (Khabarovsk region, Vanino village) and Maly Port (Primorye, Nakhodka). Inspection of port facilities and equipment, an analysis of measures taken to prevent dust dispersion and an analysis of the reduction in the environmental impact were carried out. The study confirmed that Vanino Bulk Terminal has all the necessary means for efficient management of environmental conditions and a system for monitoring the dispersion of coal dust; the terminal also takes all necessary measures to minimise the dispersion of dust according to the standards approved for similar companies abroad. As was confirmed, the terminal develops and implements its own technologies and solutions that allow the efficient processing and export of coal in difficult climatic conditions with minimal impact on the environment. The experts noted that Maly Port, apart from the standard fencing, makes additional provisions for protecting the environment (water irrigation systems and industrial vacuum cleaners), and the impact on the environment of nearby areas is as low as it can be. Based on the results of their comprehensive analysis, the experts concluded that SUEK is making the utmost efforts to protect the environment by implementing and applying best-in-class dust suppression measures and achieving excellent results. The installation of dust shields scheduled for 2019 will help fully meet the best global standards. NRI and Idemitsu Kosan proposed a number of measures for the further development of environmental technologies at SUEK’s terminals in the Far East. It is expected that these terminals will be in full compliance with the concept of a zero-emission port.